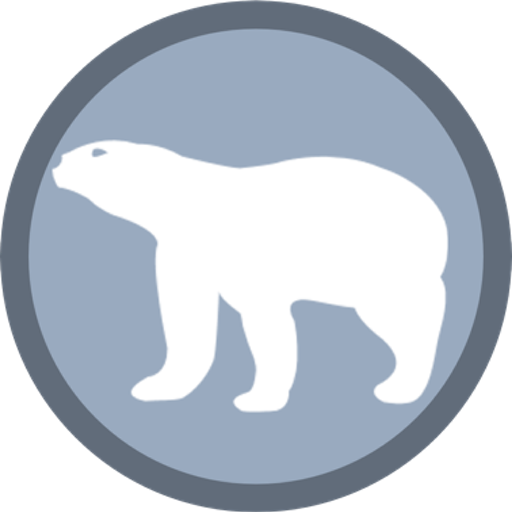 Polar bears (Ursus maritmus) are the largest of the land carnivores. They are solitary predators. Unlike most other carnivores (such as wolves) white bears will never hunt in groups. The nomadic polar bear doesn’t seem to rely on one hunting technique. The bear uses unique strategies that take months to learn and which is why adults typically prefer to kill prey as compared to young bears. Young bears will spend their initial two years of training with mother. The mother teaches her kids several techniques as well as how to survive in the natural habitat. Polar bears regularly feed on ringed and bearded seal but they also prey on larger prey such as beluga whale and walrus. The last two preys are rare because they are not as nutritious as seals. Seals provide blubber which is quite helpful during dormancy. 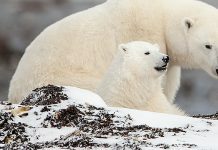 However if white bears couldn’t find seals they would rely on coastal and terrestrial plants but the change in diet is temporary. Biologists believe that polar bears kill around 44% of seal pups each year. This has been observed in the Prince of Wales Island and Cornwallis Island. Polar bears have got massive body and they need 2 kg (4.4 lbs) of fat every day. They do so by killing large number of seals in mid-June to mid-August when seals are abundant. Nonetheless, polar bears are able to spend months in starvation—an adaptation quite useful in warmer months when the sea ice melts. Main Article: How Do Polar Bears Reproduce? Polar bears reach maturity after 5 – 6 years of age. The female gives birth to 1 – 2 cubs. The small litter size and predation at an early age are reasons for polar bear’s mortality. The female plays a major part in raising cubs. During starvation when the food is scarce the mother will not be able to raise two cubs at a time. It means that she may feed only one cub. It happens when twins are born. The birth usually occurs in November and December. Adult males rarely take part in nursing. The job must be done by a mother alone which is quite tough because alongside feeding she must protect them from adult males. 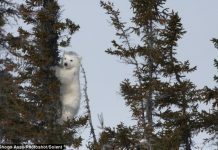 White bears are mercurial creatures. They keep moving and they don’t seem to mark territories. This is probably an adaptation to adjust with different environmental stressors. The change in weather leads to a change in bear’s territory. Bears rely heavily on seals. 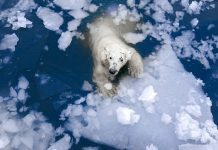 During summer when the sea ice melts bears could not hunt their primary prey i.e. seals. As it turns out, they must keep moving and make homes where seals are abundant. 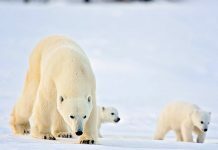 The movement in polar bears is associated with their survival. The only way to survive is to follow the prey. That is why polar bears do not defend their territories. 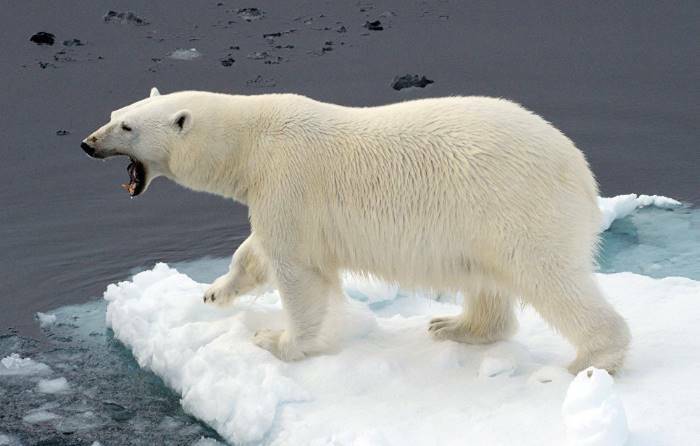 Nevertheless polar bears can be highly aggressive. 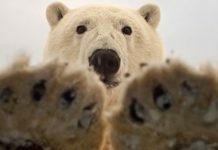 Past incidents show that polar bears do attack humans but that occurs only when they are provoked. Hungry bears are highly dangerous and they may attack humans if they must. Normally white bears will walk away and avoid confrontations. Polar bears possess extremely vast territory. The range is so wide that scientists are unable to measure the extent of its territory. This is one reason why biologists couldn’t come up with reasonable estimates of polar bear population. Do Polar Bears Poop in the Woods? Do Polar Bears Scream When they Poop? 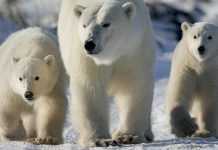 When Do Polar Bear Cubs Leave their Mother?